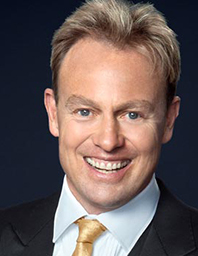 Jason Donovan is an Australian actor and singer. He initially achieved fame in the Australian soap Neighbours, before beginning a career in music in 1988. In the UK he has sold over 3 million records, and his début album Ten Good Reasons was one of the highest-selling albums of 1989, with UK sales of over 1.5 million copies. He has had four UK No. 1 singles, one of which was "Especially for You", his 1988 duet with fellow Neighbours co-star Kylie Minogue. He has also appeared in several stage musicals, most prominently in the lead role of Joseph and the Amazing Technicolor Dreamcoat in the early 1990s. In 2016, Jason Donovan toured the UK with his Ten Good Reasons and Greatest Hits Tour. Born in Australia, he now resides in London, United Kingdom. Jason presented the West London Business Awards 2015.